pH indicators are a very simple, accurate and reliable method of measuring nutrient pH. Indicators work on the principle that the color produced by the particular dye used in the indicator formulation is dependent on the pH of the solution (Fig 10.3). Experience shows that if aiming to adjust pH to 5.5 (orange) then an accuracy of +/- 0.2 is achievable. 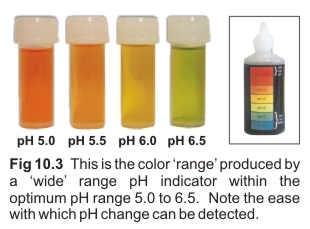 Note that pool and aquarium pH indicators are not usually suitable for nutrient solutions because they do not operate below pH 6 i.e. their color does not vary for pH’s below 6. Step 1. Sample preparation: Stir the nutrient reservoir thoroughly before sampling, especially after pH Up or pH Down is used. Ensure the sampling container is clean by rinsing a few times with the nutrient solution. Step 2. Add a drop of the indicator, mix, then compare the solution color with those on the colored reference chart (Fig 10.3). Step 3. If the pH is not between 5.0 and 6.5, adjust the pH of the nutrient reservoir.